Hard enamel pins are long lasting and durable with a very high quality appearance. The craft is a multi-step enamel process used to produce jewelry, vases, and other decorative items. For hard enamel, the enamel is added before the plating. The enamel powder is added and then stone-polished flat to the same level as the metal die lines. Each color must be baked in the oven one by one which adds to the process and cost. Once all the colors have been added then the badge can be electroplated and polished again to complete the badge. The numerous polishing processes is why the badge can achieve slightly less detail than soft enamel and why some of the metal lines are likely to spread in production and be thicker than the original design. Our hard enamel process is a modern process of the traditional hard enamel process and the main difference between our hard enamels is the actual enamel. 1. Can be preserved for 100 years without fading because it is derived from mineral ore.
2. We use hard enamel powder which import from Japan, it is mineral powder so there are only several mix color but no color differences. 3. After been burned at 850 degrees centigrade, it will have hard and smooth enamel surface, which is resistant to scratching and falling off. 4. With the features of high quality and time durability, it is the most suitable choice for corporate pins, event pins, convention pins and military pins. Only a few factories can produce cloisonne products, and in the Pearl River Delta, JIAN is the only one that can do it. If you are interested in creating a custom hard enamel pin, please contact us today. Our sales representatives can help you decide what type of pin is best for your design. What kinds of products are you offering? 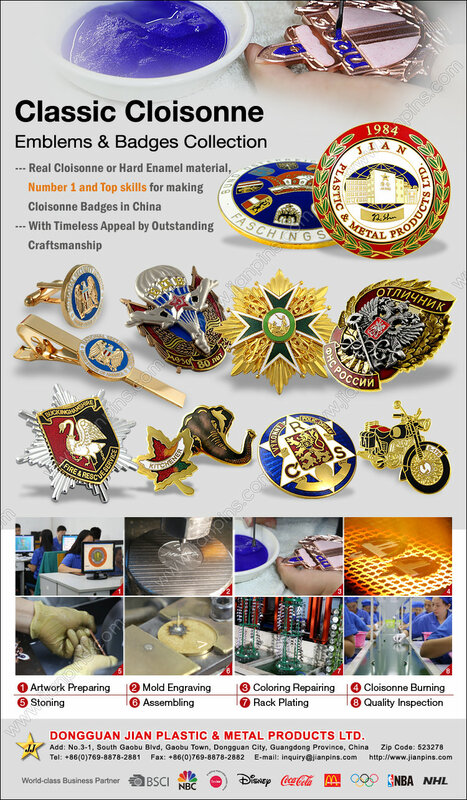 The range of our products includes Lapel pins, Badges, Cufflinks, Medals, Tie clips, Keychain, Military coins, embroidery patches, lanyards and our extended products includes soft PVC keychain, magnets, tin button badges, bottle openers etc. Any shape you want. We custom manufacture all of our products from scratch, so we can make them any shape, any size and any design. Import from China, It can not be more easy even you are not a company and have no import license, We can deliver the goods to your hands by FedEx/DHL/UPS or By Air. In General, Our MOQ is 300 PCS per item. But as we do understand that our clients would like to test market response before placing Volume Order, We will consider to take even your first order is less than 300pcs. You can email us, fax us a copy or mail us a picture. We accept all types of file formats; including ai, eps, jpg, pdf and others. What's different between silkscreen and offset printing? It is different printing technique and mainly differ in color presentation. Silkscreen often used for simple design with less and solid colors while offset printing is suitable for complex artwork and tonal colors. E.g: more like a photo effect looking. Why can't stainless steal be plated? Stainless steel has a coating on it to prevent rusty, therefore no plating is needed. We usually do plating on products that made of Bronze, copper, iron, zinc alloy and pewter. What is CMYK in the offset printing? CMYK each letter represents the color that used in offset printing – Cyan, Magenta, Yellow, Black. Why does stamping need metal borders? With stamping process, is metal border necessary? Why can' t we use stainless steel for stamping? Stainless steel as well as iron are high density materials. Stamping on high density materials, the mold will be easily damaged and result in high product default rate, therefore it is not recommended. What are the differences between Synthetic, Soft, and Hard Enamel? The major differences between these three coloring materials will be in terms of production techniques and color rendering. Synthetic Enamel is probably the best material to render bright and shiny for colors in a reasonable cost. Colors are leveled evenly to the metal boarders and totally flat on the product surface. Hard Enamel differ from Soft and Synthetic Enamel. It is natural mineral substance and melted during heating process. It is not as bright and shiny as Soft and Synthetic Enamel, but the color lasts for hundred of years without destroying on purpose. Soft Enamel, in general speaking, it is cheaper in cost compare to Synthetic and Hard Enamel. It has a similar color render to Synthetic Enamel but color zones recess and lower than metal boarders. Metal boarders are easy to define. What kind of payment do you accept? Do you accept the payment through Credit Card or Pay pal? At present, we accept the payment by T/T and by Credit card for the small amount. We are Not aim to to do once-business. We are going to build strong and long term relationship with all of ourclients . Our success is based on customers' satisfaction. Further, each order has a SOP (Standard Operation Procedure) to follow. Production is only proceeded after all details have been confirmed. We do 100% inspected before shipment, and take responsibility for default goes beyond acceptance. What guarantee do we have since advance payment is required?